KBC Bank Ireland has announced a number of enhancements to its mortgage offering that will benefit a range of customers. The changes are part of KBC’s commitment to offer long term value to customers and giving them options to lower their monthly repayments and help them reduce the costs associated with the mortgage process. KBC’s enhanced mortgage offering comes as research from the Central Bank of Ireland into switching behaviour shows just 4% of mortgage customers moved their loan to a new lender, while 6% had changed their product with their existing bank. Over eight out of ten have never considered moving their mortgage for one reason or another. The enhanced KBC offering aims to provide new and existing home buyers, movers and mortgage switchers to get better long term value on their mortgage. From Tuesday, 2nd May, KBC Bank will lower its 2 year, 3 year and 5 year fixed mortgage rates. As a result, customers (80%-90% LTV) can fix the interest rate on their mortgage from as low as 3.10% for three years. 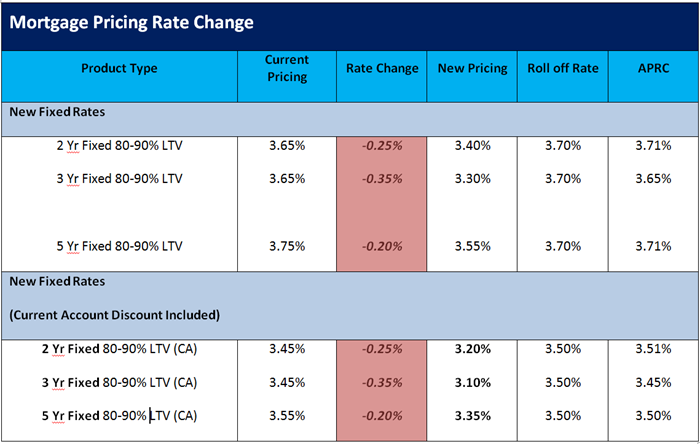 The competitive new rates will be available for both new customers of KBC, and current KBC mortgage customers, whether on a variable rate or at the end of an existing fixed term rate. All mortgage customers can continue to avail of the 0.20% mortgage rate discount where they hold a current account with KBC (and mandate their salary to that account). In addition, homeowners who make the switch to KBC to save on their mortgage repayments will benefit from a €3,000 contribution towards their costs of switching their mortgage. The contribution is open to any customer who switches their mortgage to KBC before September 30th 2017.